The revision in the wage structure would entail an estimated expenditure of Rs 1257.75 crore (Non-recurring expenditure - Rs 860.95 crore and Recurring expenditure of Rs.396.80 crare) during 2018- 19. 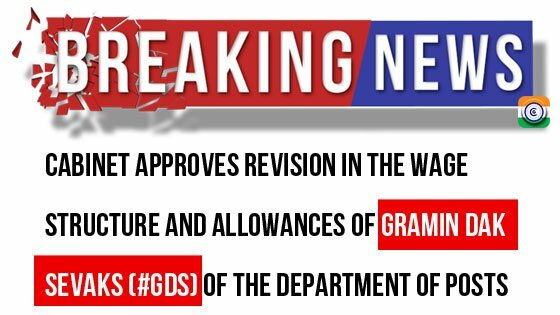 3.07 lakh Gramin Dak Sevaks will be benefitted by this wage revision. Time Related Continuity allowance (TRCA) structure and slabs have been rationalised. The total GDSs have been brought under two categories viz. Branch Postmasters (BPMs) and other thanBranch Postmasters namely Assistant Branch Postmaster (ABPMs). It is decided to continue the calculation of the ex- gratia bonus by applying the calculation ceiling of Rs.7000 as basic TRCA + DA till such time a new scheme is devised. Arrears for the period 1.1.2016 to the date of implementation will be paid by increasing the basic TRCA drawn during the period by a factor of 2.57. The arrears will be paid in one instalment. A new Riskand hardship Allowance has been introduced. Other allowances Viz. Office maintenance allowance, Combined duty allowance, Cash conveyance charges, Cycle maintenance allowance, Boat allowance and Fixed Stationery Charges have been revised. 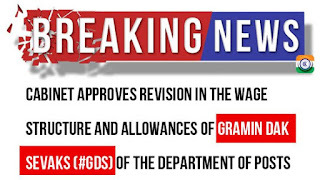 The revision would result in improving the wages, allowances and discharge benefits of Gramin Dak Sevaks resulting in providing efficient & cost-effective basic postal facilities in the rural area. The proposed increased emoluments will enable him to improve his socio-economic standing. The Branch Post Offices are the fulcrum for provision of Communications and financial services in the village and are located in remote areas. The Post Master has to deal with large sums while making payments to customers; hence accountability is already built into his work. The enhanced remuneration will increase the sense of responsibility. Moreover, with the roll out of the India Post Payment Bank (IPPB), the CDS network is expected to play a key role in the process of financial inclusion of the rural population. The Extra Departmental system in the Department of Posts was established more than150 years ago to provide basic, economical and efficient postal services in the rural areas where there was no justification for engaging full time regular employees. One Lakh Twenty- Nine Thousand Three Hundred forty-six (1,29,346) Extra-departmental Branch post offices are primarily manned by Gramin Dak Sevak Branch Postmasters. In addition, Gramin Dak Sevaks other than Branch Postmasters are also working in Branch, Sub and Head Post offices. The main features of the engagement of Gramin Dak Sevaks are that they work for part time ranging from 3 to 5 hours per day and supplement their income from other vocations so as to have adequate means of livelihood for themselves and their families. They remain in service up to the age of 65 years.